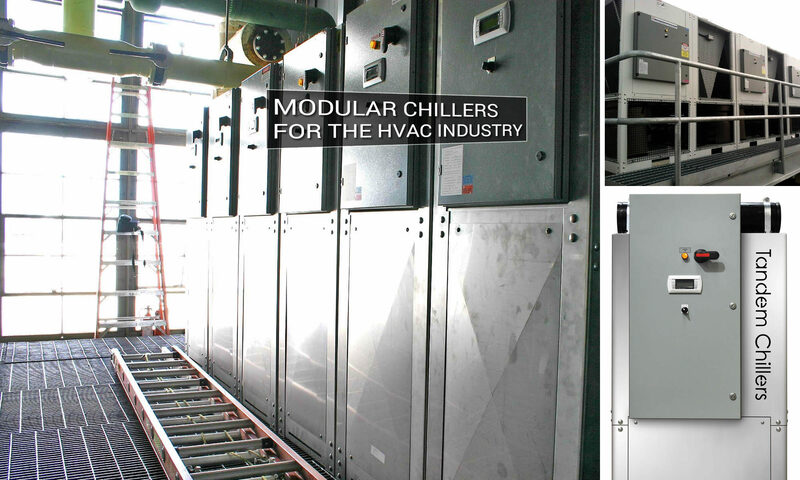 Tandem Chillers manufactures modular chillers for the heating, ventilation and air conditioning industry (HVAC). Tandem Chillers brings over 40 years of experience in the process cooling industry to the new design of “service-in-place” chillers for the air conditioning industry. Through our sister company, Temperature Corporation, we have built a reputation for designing and manufacturing well thought-out equipment incorporating standard features such as hot gas bypass, digital scroll compressors and for using only stainless steel metal components for structural frames, panel enclosures and tanks in the production of all of our cooling equipment. Read about our participation in the HVAC Retrofit of the Michael A. Bilandic Building in Chicago. At Tandem Chillers, we take special pride in being able to provide a personal touch not often found in our industry. Unlike larger companies, don’t be surprised if the owner himself answers the phone or personally returns your email request for a quote. We are, above all else, a real cool solutions provider making us the ideal fit for solving all your air conditioning problems . We solve problems and our new Service In Place Chillers are a perfect case in point. We take extreme pride in our equipment and our relationships with all our end users, agents, suppliers and staff. Our venture into the HVAC chillers market is built on an established foundation and proven technology. We are committed to building on this foundation and look forward to working with you and your organization for your modular chiller requirements.